If you want to be heard, shout-out in the Twitterverse and hope it goes viral. So let’s sit back and watch a tween social experiment unfold. 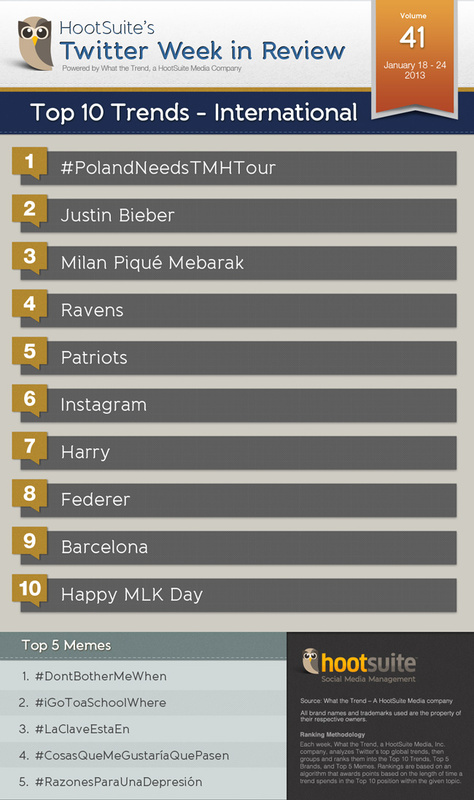 Number one on our global Twitter trends is #PolandNeedsTMHTour, which references pop band One Direction’s upcoming mega tour titled, “Take Me Home.” Beginning on February 23rd, 2013, One Direction begins their tour around the globe. And you guessed it, thousands of Polish fans want their country added to the list. Is this viral hashtag enough to make a country’s dream come true? Remember last week, when I said Twitter was going ga-ga for Lady GaGa? 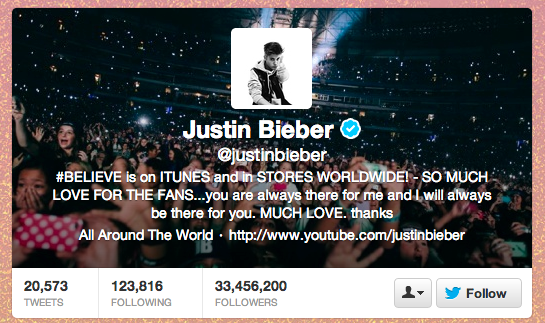 Well, there’ll be one less lonely girl (#OLLG) this week because Justin Bieber, surpassed Gaga for the most followed person on Twitter, pushing over 33.4 million followers. For an 18 year-old Canadian pop star, most followed Twitterer and a klout score of 93 is very impressive (but can he catch Obama’s 99?). Colombian singer-songwriter Shakira and Spanish heartthrob, I mean star footballer, Gerard Piqué just had a son. 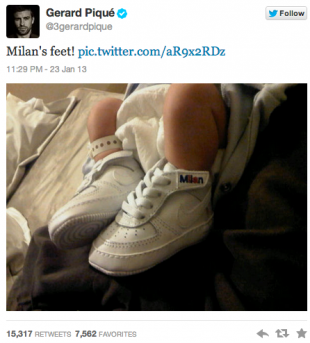 Milan Piqué Mebarak, born on Tuesday in Barcelona, Spain, is trending. According to news, the singer and her dark-haired baby are “in excellent health,” with Milan weighing in at 6 lbs., 6 oz. Turns out that Milan has quite the shoes to fill. 28 -13, are widely discussed as they will be playing the San Francisco 49ers in the upcoming mega-event, the Super Bowl. Whereas the Patriots are sadly trending because they lost their division final and, obviously, will not be moving forward to claim this year’s Super Bowl title. In the Twittersphere this week, several British Harry’s were popular. The first trender, Prince Harry, was discussed because his tour of duty in Afghanistan has come to an end. And, because troops will soon be withdrawing from the Middle Eastern nation, people are curious as to whether he’ll ever return to duty with his helicopter squadron. Meanwhile, One Direction pop singer, Harry Styles continues to make headlines because he’s dating the ever-popular babe, Taylor Swift. Plus, a pop star’s dog named Harry passed away this week… RIP Harry. Check out this week’s USA Twitter trends of the week. Join us next week, for another look at the world through the Twittersphere.